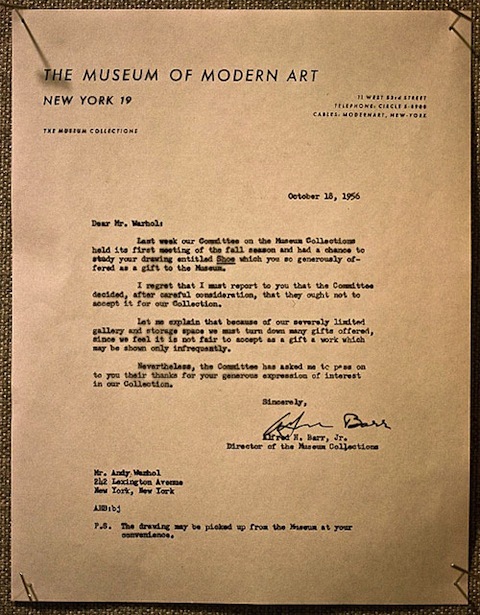 Every successful artist must master the art of accepting rejection. “Fail better,” said Beckett in his grim euphemism for perseverance. “I love my rejection slips,” wrote Sylvia Plath in every hopeful poet’s favorite quote. “They show me I try.” Plath—who also wrote “I am made, crudely, for success”—collected scores of rejection letters, receiving them even after the considerable success of 1960’s The Colossus and Other Poems. 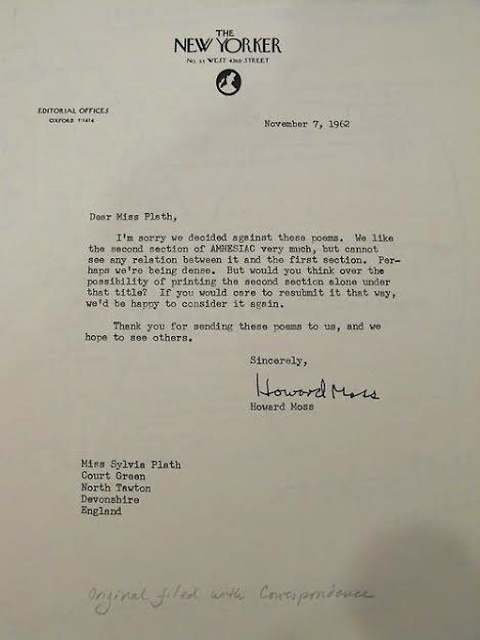 The 1962 letter above (click here to view in a larger format), from The New Yorker, doesn’t exactly reject a Plath submission, but it does recommend cutting the entire first section of “Amnesiac” and resubmitting “the second section alone under that title.” “Perhaps we’re being dense,” demurs editor Howard Moss. The rejection must have been all the more painful since Plath was under a contract with the magazine, which entitled her to “an annual sum for the privilege of having a ‘first reading’ plus subsequent publishing rights to her new poetry,” Plath scholars tell us. And yet “much to her distress she mainly received rejections during November and December 1962.” The poem was eventually broken in two, with the first half published as “Lyonnesse,” but not by Plath herself but by publishers after her death. Hear Plath read the full poem as she intended it in her edition of Ariel, above. 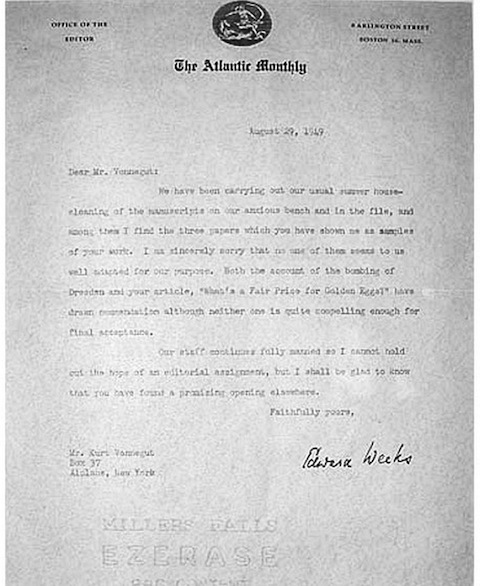 Kurt Vonnegut received an impersonal, and it would seem, long-overdue rejection letter from editor of The Atlantic Edward Weeks in 1949. Weeks writes breezily that he found Vonnegut’s “samples” during the “usual summer house-cleaning,” announcing its slush-pile status. Weeks does at least give the impression that someone, if not him, had read Vonnegut’s submissions. The aspiring writer was 27 years old, striking out “just a few years after surviving the bombing of Dresden as a POW,” Letters of Note informs us, and still twenty years away from publishing his groundbreaking novel Slaughterhouse Five. Letters of Note also provides us with the transcript below for the badly faded typescript. We have been carrying out our usual summer house-cleaning of the manuscripts on our anxious bench and in the file, and among them I find the three papers which you have shown me as samples of your work. I am sincerely sorry that no one of them seems to us well adapted to for our purpose. Both the account of the bombing of Dresden and your article, "What’s a Fair Price for Golden Eggs?" have drawn commendation although neither one is quite compelling enough for final acceptance.